The Eurasian Economic Union (EEU, EAU, or EAEU), a new Russia-led free trade area, just welcomed Kyrgyzstan as a new member on May 8. The EEU, sometimes known as the "Eurasian Union" for short (or in reference to its possible future direction), officially launched at the beginning of this year, but has been in development since several years ago. 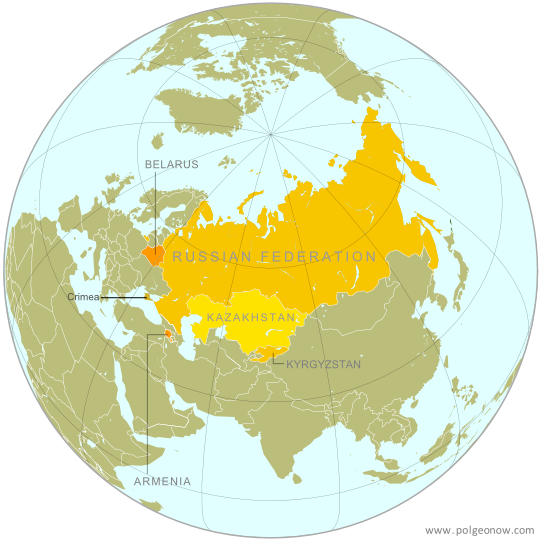 The union has four other member countries: Russia, Belarus, Kazakhstan, and Armenia. More: What is the "Eurasian Union"? Kyrgyzstan started the process of joining the EEU last summer, and its entry in the organization has been delayed twice, allegedly due to last-minute hang-ups in the negotiations. The small central Asian country finally signed on as a full member last Friday, at a summit meeting of the leaders from all five member countries. To ease economically-struggling Kyrgyzstan's entry into the EEU, Russia has approved hundreds of millions of dollars in aid to the country. Kyrgyz President Almazbek Atambayev, for his part, has been enthusiastic about joining the union, and Russia-bound migrant workers are optimistic about the change. However, many Kyrgyz citizens are concerned that EEU rules favoring trade between the organization's members could hamper trade and investment from neighboring China. Graphic of the Kyrgyz flag is in the public domain (source).